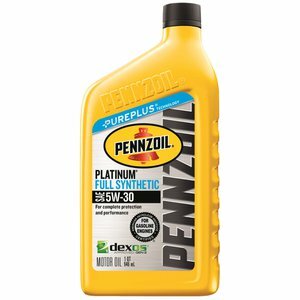 Pennzoil SAE 5W30 Synthetic Motor Oil, Qt. Formulated with superior active cleansing agents, Pennzoil Platinum synthetic oil lubricates cleans and protects engines to help maintain responsiveness and bring invigoration to your drive. The Pep Boys Say: "Changing to Pennzoil Platinum synthetic oil protects your engine better than conventional oil, giving it a longer life."